There is always something schizophrenic about logic in Deleuze, which represents another distinctive characteristic: a deep perversion of the very heart of philosophy. Thus, a preliminary definition of Deleuze’s philosophy emerges: an irrational logic of aberrant movements. 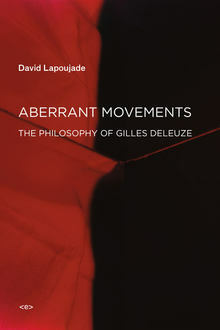 In Aberrant Movements, David Lapoujade offers one of the first comprehensive treatments of Deleuzian thought. Drawing on the entirety of Deleuze’s work as well as his collaborations with Félix Guattari, from the “transcendental empiricism” of Difference and Repetition to the schizoanalysis and geophilosophy of Anti-Oedipus and A Thousand Plateaus, Lapoujade explores the central problem underlying the delirious coherence of Deleuze’s philosophy: aberrant movements. These are the movements that Deleuze wrests from Kantian idealism, Nietzsche’s eternal return, and the nonsense of Lewis Carroll; they are the schizophrenic processes of the unconscious and the nomadic line of flight traversing history—in short, the forces that permeate life and thought. Tracing and classifying their “irrational logics” represent the quintessential tasks of Deleuzian philosophy. Rather than abstract notions, though, these logics constitute various modes of populating the earth—involving the human as much as the animal, physical, and chemical—and the affective, mental, and political populations that populate human thought. Lapoujade argues that aberrant movements become the figures in a combat against the forms of political, social, philosophical, aesthetic, and scientific organization that attempt to deny, counter, or crush their existence. In this study of a thinker whose insights, theoretical confrontations, and perverse critiques have profoundly influenced philosophy, literature, film, and art over the last fifty years, Lapoujade invites us to join in the discordant harmonies of Deleuze’s work—and in the battle that constitutes the thought of philosophy, politics, and life.